Until then, here’s David’s favourite potato dish, at the moment. 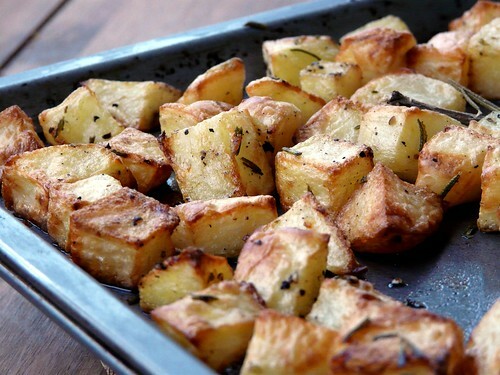 They’re like a cross between chips and roast potatoes. No bad thing at all! Peel the potatoes and cut into 2cm chunks. Toss with olive oil, salt, pepper and rosemary. Scatter on a baking tray. Don’t crowd them or they won’t crisp properly. Cook in a 200 oC oven for 30-40 mins (turning occasionally) until golden brown. I expect it makes the kitchen smell gorgeous , too ! Yep, a classic. Bloody marvellous! Yummmy-well done for keeping up with the training…think how good you will feel this time next week! I tried to make this recipe, but our russets were soft, so I substituted sweet potatoes instead. Delicious. Then, because we had a hankering for corned beef hash, I added them to some corned beef and sauteed onion … wonderful. Thanks for the recipe and inspiration. Look so very tasty on this cool, cloudy day … will definitely try these for dinner tonight! I would be so happy to pair these with pork or chicken, or just to eat them on their own. What a beautiful brown flavor! 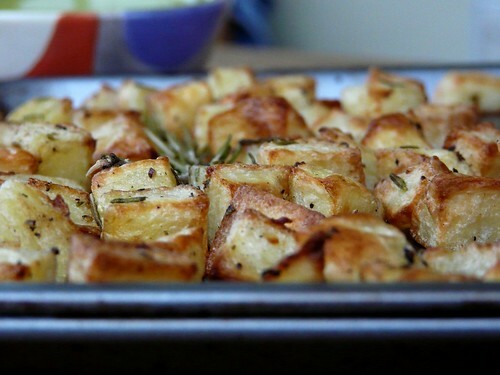 I love roasted potatoes…right now they would just hit the spot on this slightly chilly fall evening. 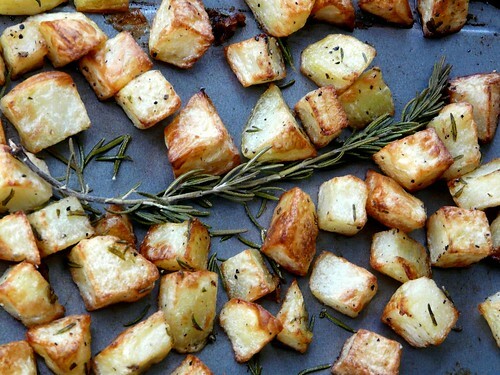 My favorite way to eat potatoes, these look delicious! Roasted potatoes are great. I love them with breakfast.